As car infotainment systems go, Volvo's Sensus system is certainly an eye-catcher with its gorgeous 9-inch portrait display dominating the center stack, so I was excited to have an opportunity to go hands-on with Sensus to see how it works and how well it integrates with CarPlay, which is broadly supported in Volvo's lineup. 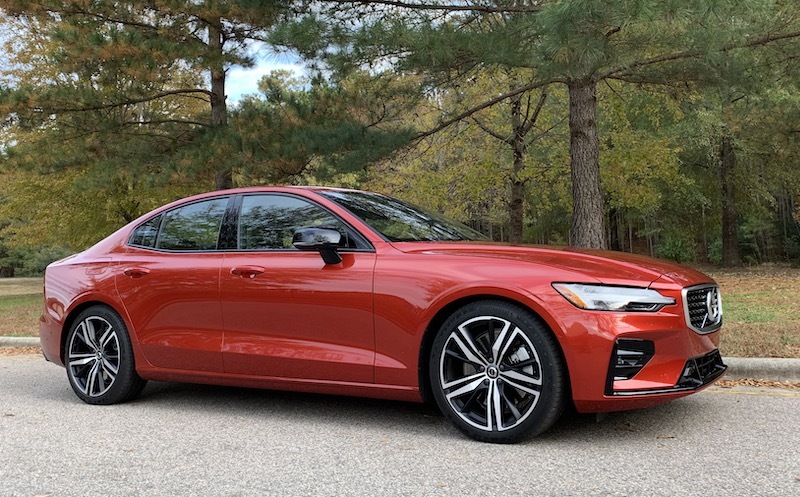 My test vehicle was a new 2019 S60 T6 AWD R-Design sedan, and the 2019 S60 is the first Volvo to be manufactured in the United States, coming out of the company's new plant outside of Charleston, South Carolina. My S60 came packed with technology and safety features including lane-keeping assist and oncoming lane mitigation, parking assist, blind spot monitoring, and cross traffic alerts. A $2,500 Advanced Package adds even more features including a 360º view camera, adaptive cruise control with pilot assist, heads-up display with speed and navigation, and active bending headlights to enhance illumination in the direction you're steering. My test vehicle was equipped with a high-end $3,200 Bowers & Wilkins 15-speaker audio system that unsurprisingly sounded fantastic. All told, the MSRP on my test vehicle approached $55,000, but the Sensus system with CarPlay support is standard even on the entry-level Momentum trim starting at $35,800. From a hardware perspective, the Sensus system is very good. The portrait display is beautiful, bright, and sharp, although it does tend to show fingerprints on both the screen and the glossy black frame surrounding it. Still, it's quite a statement feature in the way it dominates the center stack. The Sensus system uses a combination of a resistive screen and infrared sensors to detect touches, which lets the system work even while you're wearing gloves, a feature you might expect from a Swedish car company. In fact, due to the infrared sensing, the system can even register touches without actually quite touching the screen, which is a little unnerving at first. It might not be quite as responsive as a capacitive screen in some cases, but it's still a very usable system for a vehicle designed to be comfortable in cold climates. A single hardware home button right below the screen quickly gets you out of whatever you're doing and back to the main screen. 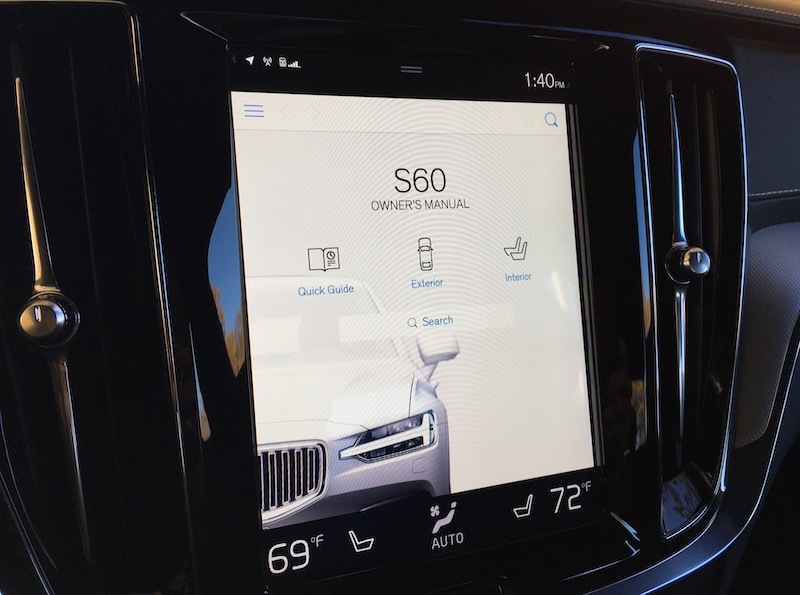 On the software side, Volvo's Sensus system is based around a set of tiles appearing on the main home screen, offering quick access to navigation, audio, and phone functions, as well as another most recently used function at the bottom. The tiles make it easy to hop in and out of specific functions while generally keeping a mini view of other functions accessible. From the main screen, you can swipe to the left to find a host of vehicle control options that you likely won't need to look at terribly frequently, and a swipe down offers access to settings and a digital owner's manual that you'll likely visit even less frequently once you're up and running. The Sensus navigation app offers a decent-looking and usable map view, and if you've got the digital driver's side display and heads-up display you'll be able to see map and turn-by-turn details on those screens as well. The main map view supports both pinching and double tapping to zoom, while panning is easily accomplished with a finger drag. The map can be viewed as either a large tile with audio and phone tiles still accessible or in a "full-screen" view that takes up the entire display with the exception of the climate control strip at the bottom. Unfortunately, once I looked beyond interacting with the map itself, I found the built-in navigation to be rather clunky to use in practice. Voice input is by far the most convenient and safest method for interacting with navigation systems, and the voice assistant that controls Sensus falls flat here. We're in that in-between time where vehicle voice assistants are still transitioning to the natural language experience we've become accustomed to with Siri and other assistants on our mobile devices and around our homes, and like a number of other car manufacturers, Volvo has yet to really make that transition with Sensus. With Sensus, you'll need to use specific phrases to trigger the various functions, so that means if you want to set a destination you'll have to use a specific "go to" trigger phrase rather than other variations like "take me to." About the only deviation is a "take me home" command that will work if you've set a home location. The "go to" destination input method is a little bit clunky, and it gets worse if you don't know the address and want to search by name. It's a multi-step process that is quite distracting and feels like it takes forever. Initial results of a POI search for "Starbucks"
Once you choose an item, it will suggest a number of nearby Starbucks locations and you'll again have to choose by line number using either your voice or the arrow and selection buttons on the steering wheel. But you're not done yet: Once you select a location, the system will ask you whether you want to call the location or set it as a destination. Only after you make that choice can you be on your way to get a cup of coffee. Beyond the multi-step voice interface, I found the POI database overall to be rather poor, with the system having difficulty finding certain destinations I commonly visit. In fact, the entire "churches" category was empty in my area, making it difficult to obtain directions to my sons' Cub Scouts meeting, while the system was similarly unable to pull up any FedEx locations near me. The other end of the voice assistant could also use some improvements, as it doesn't always properly recognize the context of what it's speaking. For example, when confirming a destination and reading a street address containing "Dr" back to you, it will spell out the "d-r" rather than interpreting it as "Drive." Similarly, if an address contains "Pkwy," the voice assistant attempts to pronounce it as a word rather than recognizing it as "Parkway." Or if your destination is on U.S. 70, for example, the assistant will say "us 70." Some other abbreviations like "Rd" and "St" are handled properly. 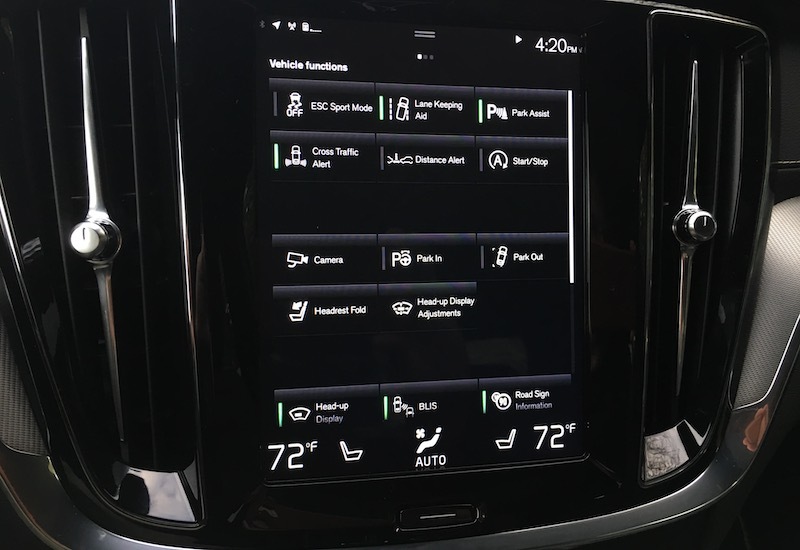 Importantly, Volvo seems to recognize the shortcomings of its current Sensus system, and the navigation system in particular, as the company announced earlier this year that its next-generation Sensus system will use Google Maps, Google Assistant, and Google Play apps. That partnership isn't expected to come to fruition until 2020, however, so we'll have to hold tight while we wait for major improvements. Anyway, back on the main Sensus home screen, a swipe to the right takes you to an apps page that gives you access to various types of applications including the built-in audio sources, apps like Pandora, Spotify, and Yelp that can be accessed if you have an active data connection, driver performance data like fuel economy, SiriusXM Travel Link features like nearby gas prices, and more. The S60 comes with hotspot connectivity, so you can set up an LTE hotspot to connect other devices while in the car. Alternatively, you can connect the car to your phone's data connection to provide internet access for the Sensus system. 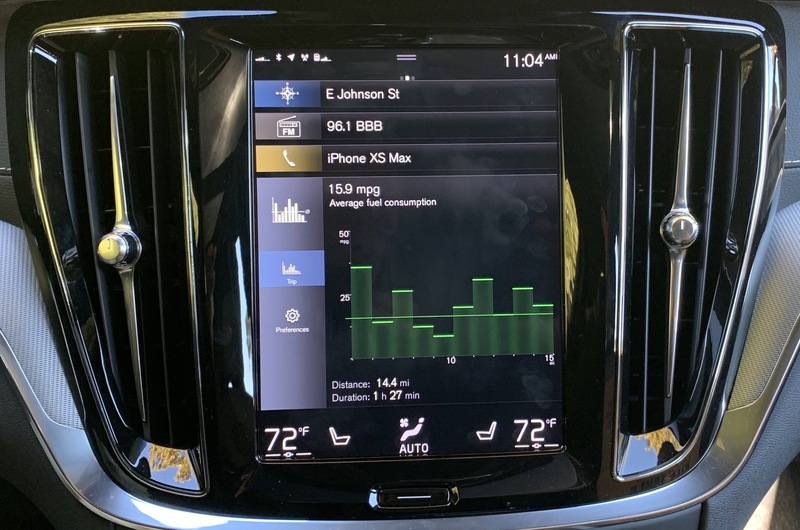 Volvo has gone with an almost entirely digital set of climate controls, due in significant part to the large portrait display that leaves little room for additional hardware controls. A single row of buttons underneath the display gives you access to the front and rear defroster, but otherwise all climate controls are handled through the touchscreen. At the bottom of the Sensus display, there's a persistent strip dedicated to climate control, which displays the temperature settings for driver and passenger, fan settings, and heated seat/steering wheel status. Tapping on either of the temperature settings brings up a scale to allow you to adjust the set point and optionally sync both zones to the same temperature. Tapping on the fan control icon brings up an overlay that lets you control defrosters and fan speeds and zones. An AUTO Climate setting helps manage your comfort automatically based on your temperature settings, so at least you can kind of set it and forget it. 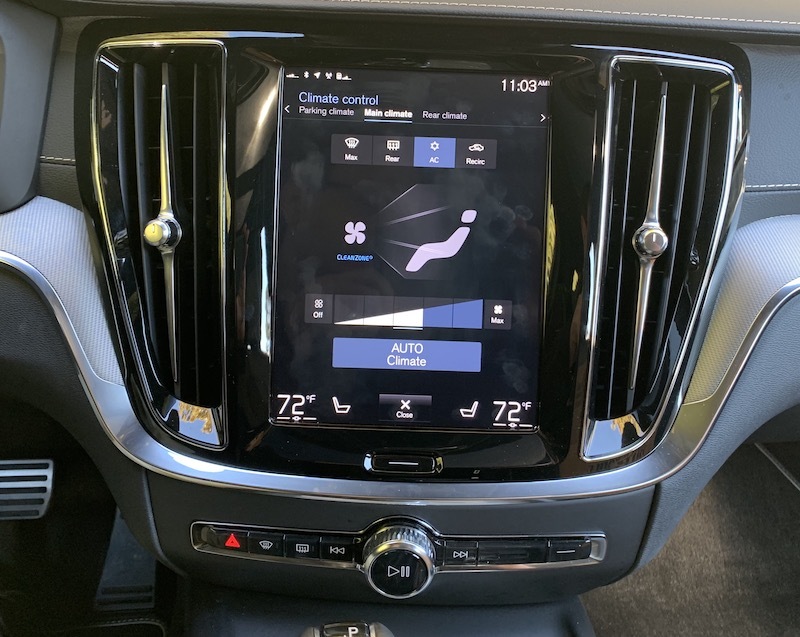 Swiping to separate pages gives you options for controlling rear climate and setting schedules for climate control while the vehicle is parked for situations where you get in the car at a set time each day. For rear seat passengers, there are also touch controls on the rear of the center console. In general, I much prefer hardware climate controls to software ones, and the Sensus system hasn't changed my opinion. You can't adjust software controls by feel, and Sensus requires multiple steps to adjust settings. Adjusting the temperature by touch requires at least two taps: one to open up the temperature settings and one to set the new desired temperature. If you want to immediately get back to what you're doing, a third tap is needed to close the temperature settings, although they do go away on their own after a few seconds. It's a similar story for the heated seats. 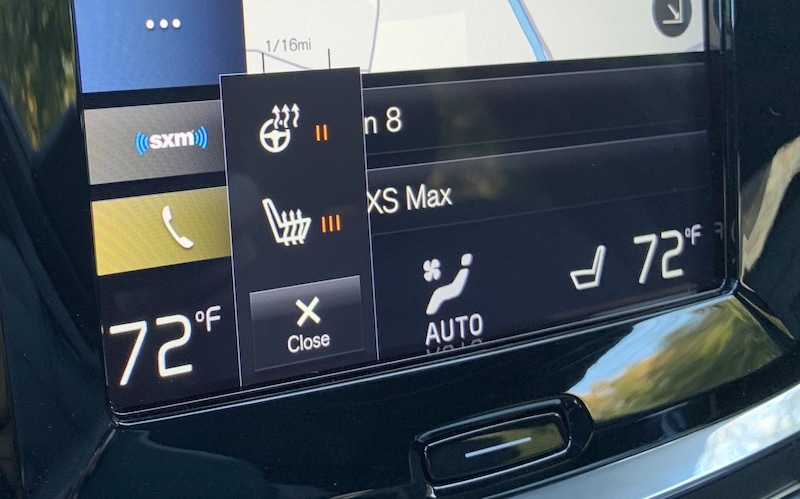 On vehicles like mine that are equipped with both heated seats and heated steering wheel, you need to tap the seat icon to open the settings, and then tap one or more times on seat and/or steering wheel icons to adjust the heating level. Granted, many of these adjustments can be made using the voice assistant if you know the proper trigger words, but there are plenty of cases where I'd prefer using making changes by hand rather than voice, and the Sensus system just requires more steps than it should. 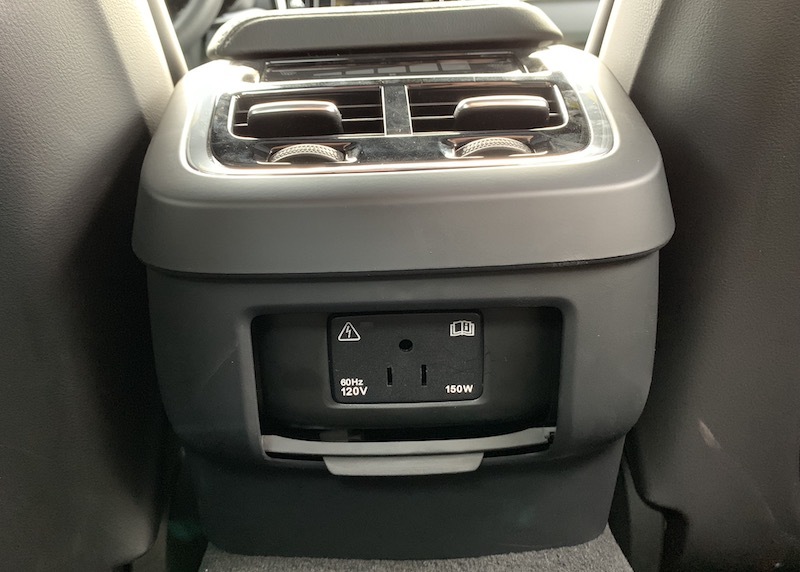 The S60 comes with a pair of USB ports inside the center console, one of which connects to the Sensus system while the other is charge-only. 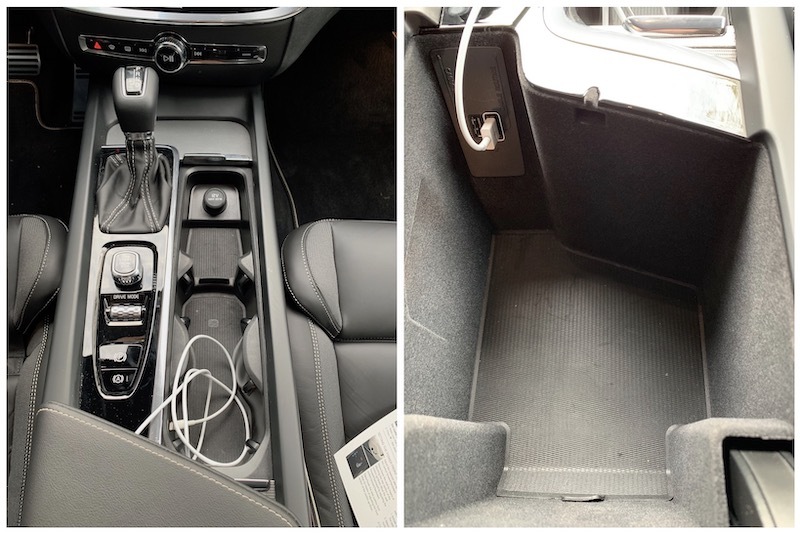 A connected phone can be stored either inside the console compartment or in a cupholder, and the compartment lid is designed to accommodate routing a cord out of the compartment. Unfortunately, there are no rear USB ports for passengers. By default, there's a single 12V port in the rear of the center console, but upgraded packages offer a 120V outlet in that location. That's great for charging items requiring higher power, but for charging iPads for the kids I found it inconvenient to have to make sure I had a power adapter in addition to a charging cable. 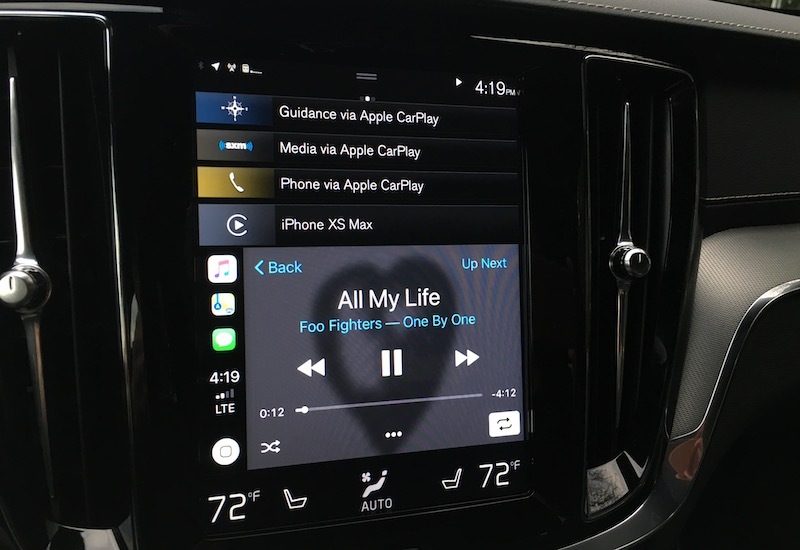 As with almost every other car manufacturer, Volvo uses a wired CarPlay implementation, requiring you to use a Lightning cable to plug the phone into a designated USB port in the center console compartment. Somewhat annoyingly, if your phone is already paired to the car via Bluetooth, you'll get a pop-up asking you if you're sure you want to disable the Bluetooth connection and switch to CarPlay every time you plug it in, and I couldn't find a way to disable that notification. When CarPlay becomes active, it takes up roughly half of the Sensus system's display, sitting just above the climate control band and below the rest of the Sensus main screen tiles. 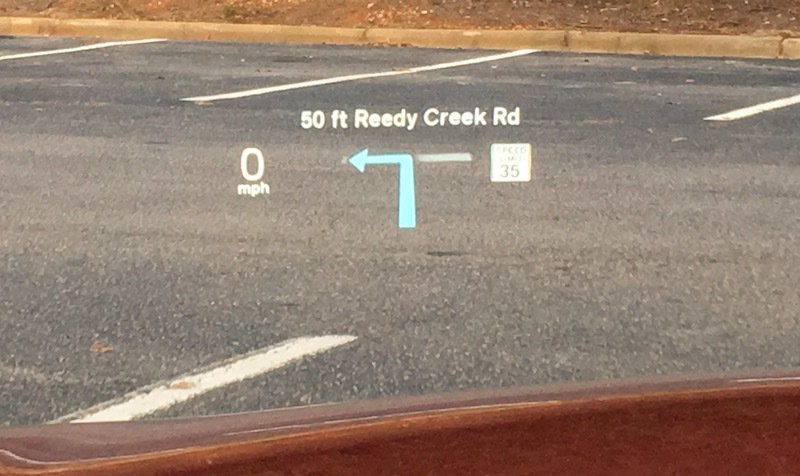 This gives the CarPlay interface a roughly 6.5-inch diagonal size, which is a bit small compared to many other systems and so much of the Maps view is covered by the various text boxes, for example. It's also rather low on the center stack, so it's definitely out of the driver's immediate line of sight. 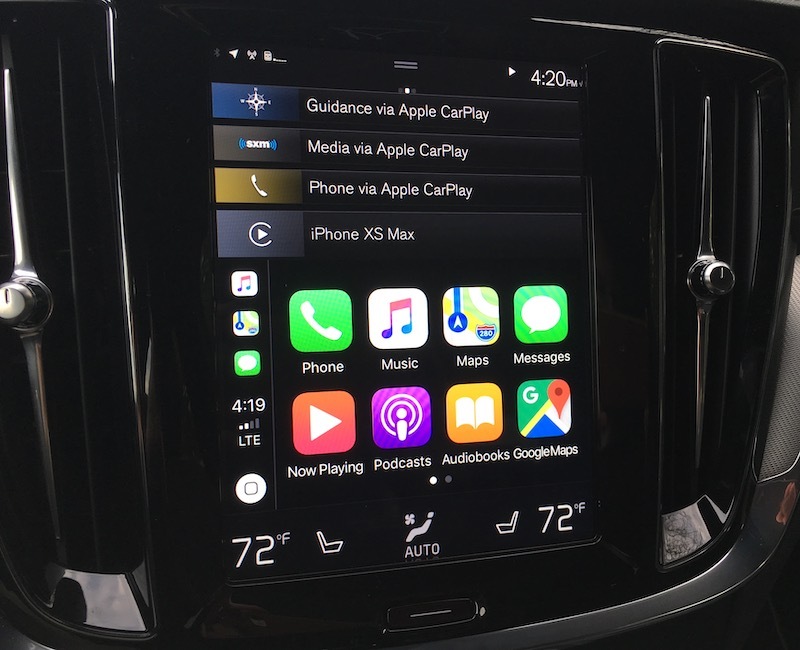 Volvo is striving for some seamless integration between CarPlay and Sensus by only using a portion of the display and still allowing other tiles to be visible, but it could be a lot better than it is. Beyond CarPlay, you're limited to seeing the three default tiles of navigation, audio, and phone, and several of these functions are essentially deactivated since you're using CarPlay. With CarPlay active, your phone is being handled through the CarPlay interface rather than the Sensus system, and the same is true of navigation if you've got a route going in CarPlay. It's nice having quick access to non-CarPlay audio sources like SiriusXM or radio, but even then it's just a single line of information that could be a lot more useful with some tweaks. 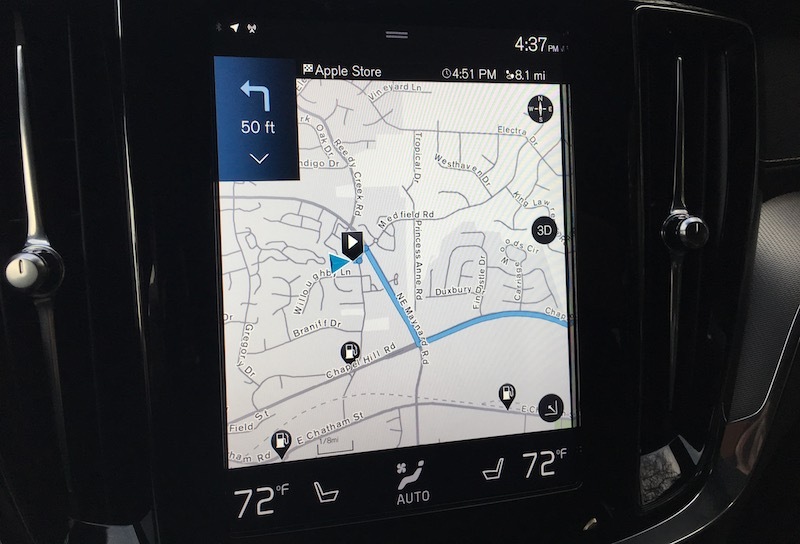 CarPlay is managed almost entirely via the Sensus touchscreen. 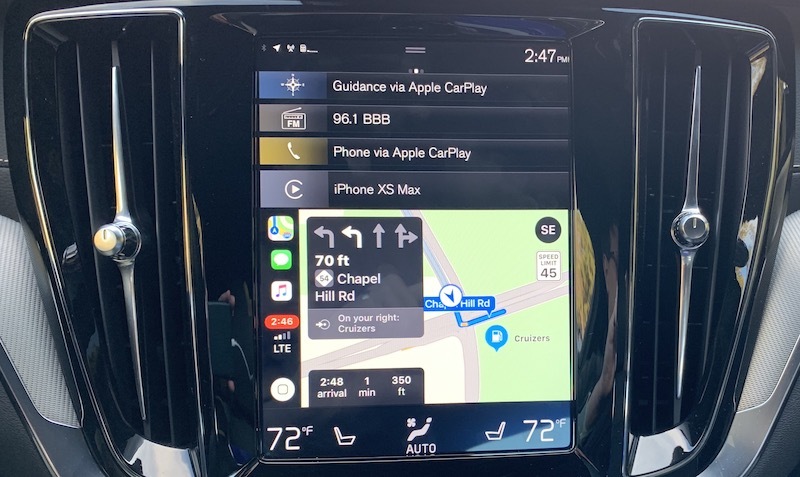 The thin strip of hardware controls below the screen includes a volume knob, mute/pause button, and forward/back navigation of tracks or stations that will work with CarPlay audio sources, but these can't otherwise be used to navigate around the CarPlay interface. That's generally fine, as hardware control of CarPlay is rather cumbersome. As gorgeous as the big 9-inch portrait screen is, the overall Sensus experience comes up short for me. 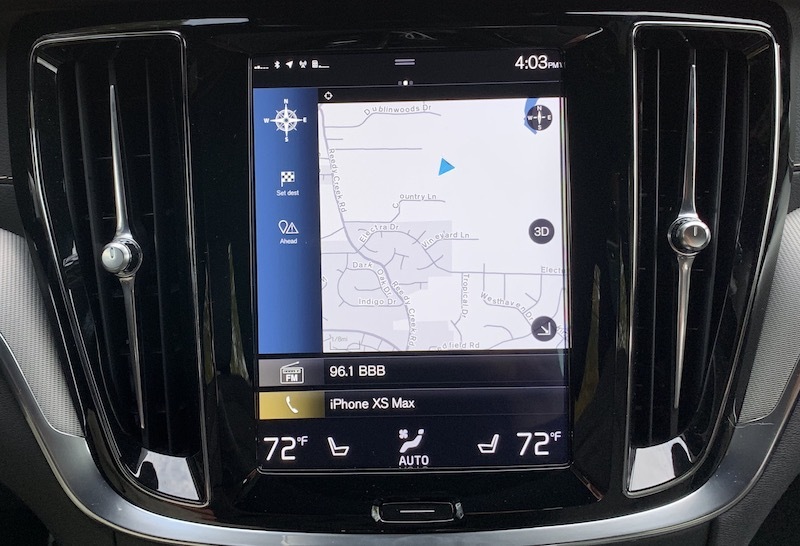 A lack of natural language voice recognition and a poor POI database really hamper the usability of the built-in navigation in particular, and it just feels like Volvo is trying to do too much with the touchscreen. The large tiles on the main home screen are easy to touch, but overall they can't display a whole lot of information at one time, which means lots of tapping in and out to make adjustments. With so many different directions to swipe from the main home screen and then also scrolling sometimes needed to see those entire pages, it just feels like Sensus isn't terribly intuitive. Combining an underperforming voice assistant with a complicated touchscreen system, I find it rather hard to accomplish what should be simple tasks. 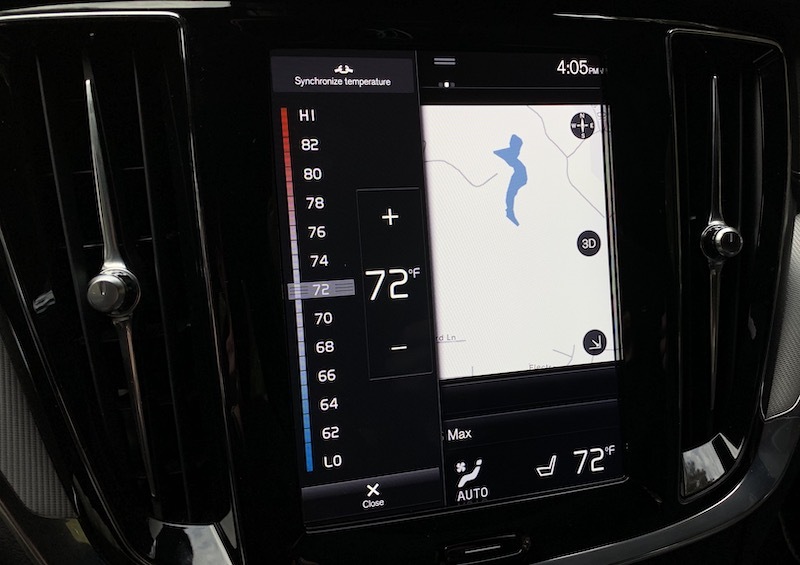 Here's hoping that the next-generation Sensus system will make some significant strides forward in the usability department, as the hardware really does have some great things going for it that contribute toward a premium, sophisticated feel for Volvos. 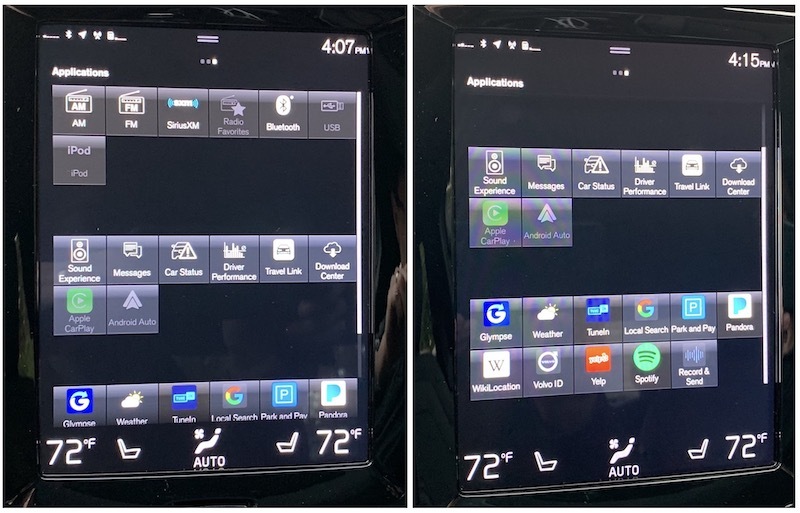 I do appreciate the attempt at integrating CarPlay into the Sensus system, and it's fairly easy to hop back and forth between features like Apple Maps and SiriusXM, but again, I feel the integration could be significantly improved by making changes such as moving the CarPlay display to the top of the screen for better visibility and offering more information-rich and customizable tiles to help make the most of the Sensus interface that surrounds CarPlay. 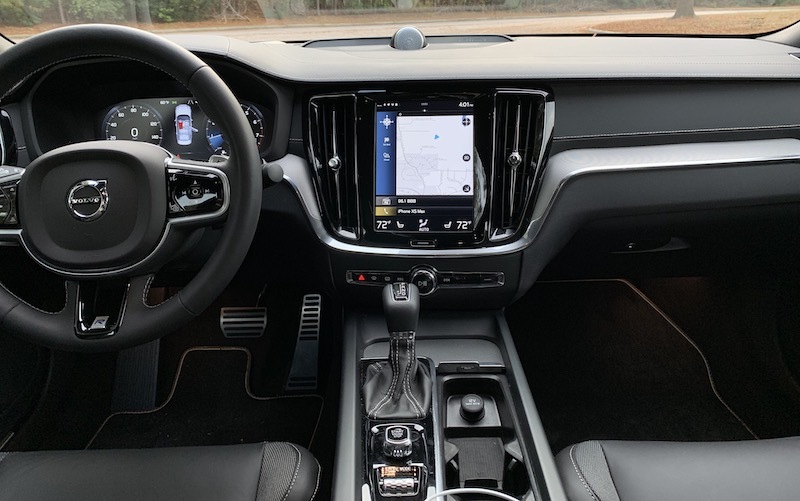 I love that CarPlay and Sensus are standard across not only the S60 trims, but the entire Volvo lineup in the U.S. as of the launches of the 2019 S60 and V60. 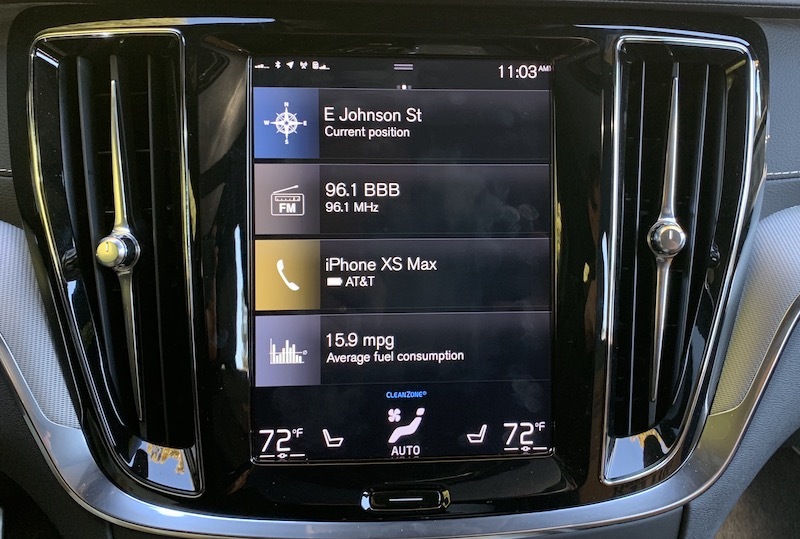 Of course, Volvo's entry-level trims aren't exactly low-cost, but when other luxury car manufacturers are requiring higher trim levels or even separate charges for CarPlay support, it's nice to see Volvo all-in on supporting the technology. The 2019 Volvo S60 starts at $35,800, but various trim, engine, and package options can push the total close to $65,000. Fortunately, Volvo builds in a decent number of safety and technology features, including CarPlay, even at the lowest levels. Not a fan of unified/infotainment climate controls either. Most screens are far too slow/unresponsive to bury these types of things under a bunch of menus. The V60 is even better! I really hope they would do more user testing on those interfaces in the future to improve it otherwise all those car brands are really losing it to Tesla. Hopefully this will be fixed in the next Sensus version based on Android P. They make great cars, and I am especially curious for their all electrical vehicles (also the Polestar). However it really needs to be combined with a great GUI. The biggest benefit of Sensus is that there are native apps and you rarely need to use CarPlay. It's nice just clicking on Spotify and having it work without needing a phone. I rarely use Carplay unless I want Waze or Google Maps. Otherwise I live in the Sensus environment. Volvo is about to roll out a new Sensus that is based on Android-P. It will have all Google Play store integrated... and endless apps. I can't imagine any reason for CarPlay once this happens. The demo looks like it will take care of all the critiques in this review (which are valid critiques). I wish Apple would take this strategy and build CarPlay native into car infotainment displays but they're only focused on their own hardware/software solutions. to be fair the climate controls are always front and center on the screen... they are never buried below menus. I miss the tactile touch of climate controls though, but I've never had an issue with them being sluggish or unresponsive. Jeez from this review this sounds like a nightmare! No wonder Tesla is eating the lunch of traditional car manufacturers. I like how the car looks, not the system inside. Everything essential should be accessible with one button press, and I mean a physical button. You can have the screen too, but it shouldn't be the only way to do things. I never stop feeling the frustration when I want to browse the radio stations in any new car and find it takes 10X longer than on my old 70s car. Same with changing channels on TV. And my iPhone plugged into aux is better for newer things than any of these systems, but it takes so long to open the Music app now that I just let whatever CD is in my car play instead. Technology is supposed to get better over time, not worse. Volvos are very overrated— had a loaner 2018 XC60 when my Audi Q5 was getting its oil changed and it was terrible. Very sluggish and autonomous driving feature was annoying and weird.